NAIROBI (Reuters) - An Ethiopian Airlines Boeing 737 passenger jet to Nairobi crashed early on Sunday, killing 149 passengers and eight crew, the airline said, the same model that crashed during a Lion Air flight in Indonesia in October. Sunday's flight left Bole airport in Addis Ababa at 8:38 am (0538 GMT), before losing contact with the control tower just a few minutes later at 8:44 am. 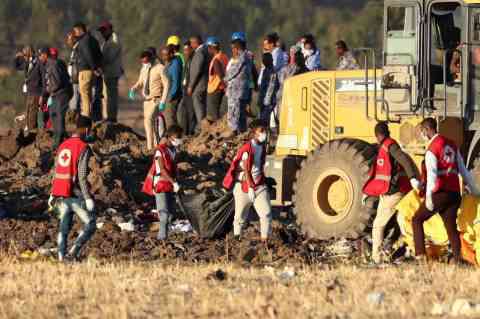 Flight ET 302, registration number ET-AVJ, crashed near the town of Bishoftu, 62 kilometres southeast of the capital Addis Ababa, the airline said. “The pilot mentioned that he had difficulties and that he wanted to return. He was give the clearance (to return back)," said Tewolde during his news conference.